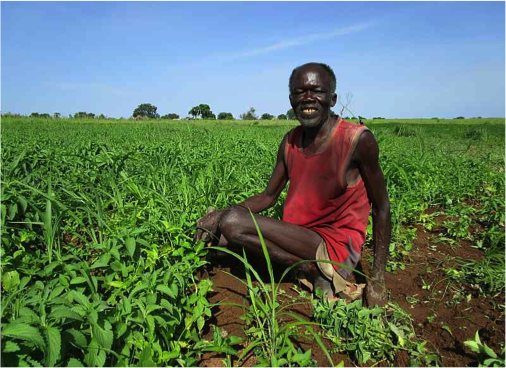 Jacques, a Karang man in Cameroon, is blind, yet he weeds his soy field with confidence and skill. Amazingly, even without his sight, he is able to find the little soy seedlings among the many overgrown weeds. He gently and patiently pulls out the killer weeds that surround each plant, rarely hurting the precious seedling. Sometimes the plant suffers damage, but because the soil is now ready to produce growth, the seedling will recover. The translation of the Karang New Testament is nearing completion, and more and more of God’s words are becoming available in Jacques’ heart language. Bob gave Jacques a solar powered audio player filled with Karang Scriptures. For Jacques, it was like receiving new soil in which to grow his life. Soon Jacques will be able to hear and respond to God’s words in Colossians 2:7: “Let your roots grow down into him [Christ], and let your lives be built on him. Then your faith will grow strong in the truth you were taught, and you will overflow with thankfulness” (NLT).